If you are the type who would like to try different brands of mascaras in your lifetime! Well, there's a chance for you to try the new Max Factor FLE Clump Defy Extensions less Php200.00! How? Visit SM Cubao, SM Makati and SM Mall of Asia this weekend (December 20-21, 2014). 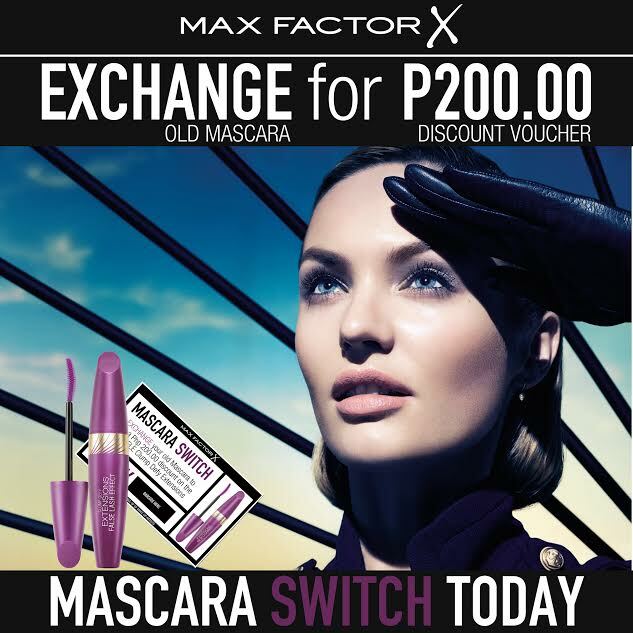 Just exchange your old mascara and instantly get Php200.00 discount voucher on the new FLE Clumb Defy Extensions! Coming from Max Factor’s best selling line, the False Lash Effect, this new product is a 3 in 1 Mascara that promises 100% volume, 100% length with 0% clumps. Enjoy "discount-shopping"! Let me know if you were able to make the Mascara Switch! Hi Ms. Nikki! Should the mascara to be switched be maxfactor? or any other brand will do? Thank you! AY MAKIKIEXCHANGE AKO!!! I love max factor mascaras!!!! thanks for sharing sis! So sorry for the late response, holiday rush eh! So did you exchange? How was it? I think they exchange full size to full size, not travel size to full size! This is a great deal. Got to replace my old one. Yay! how did it went?